A well-appointed kitchen, whether a restaurant or home kitchen, is only as good as its humblest tools. In fact, I think you’re better off investing in the simple items before moving on to fancier gadgets. And by invest, I don’t just mean “spend a lot of money;” sometimes investing is about taking the time to choose mindfully. So let’s take a look at kitchen towels. Kitchen towels?! Yes! Many of us take them for granted, but a good kitchen towel is an important multi-use tool in your kitchen that can make your work easier and more enjoyable. In this article, I’ll discuss some of the uses for kitchen towels, what to look for to find good quality towels, and I’ll review some of the options. Feel free to skip right to the listings on Amazon via the links in the table below to see the latest prices and read what other cooks have to say about these options. If you’re a paper towel junkie, consider using cloth towels for many of the tasks you’d normally tackle with paper towels. I reserve my paper use for particularly nasty spills on the floor and other jobs that feel too icky for my kitchen towels. But really, kitchen towels can likely do about 90% of the tasks many people use paper for, and there’s no need for that waste! If you take a look on chef and kitchen forums, you may notice two schools of thought on kitchen towels. Some say buy cheap ones and buy lots of them, so you can just blow through them for whatever you need and always have fresh ones available. Others rave about the transformative power high-quality kitchen towels. I think this is in large part a personal choice, and you may also find there’s a balance to strike. 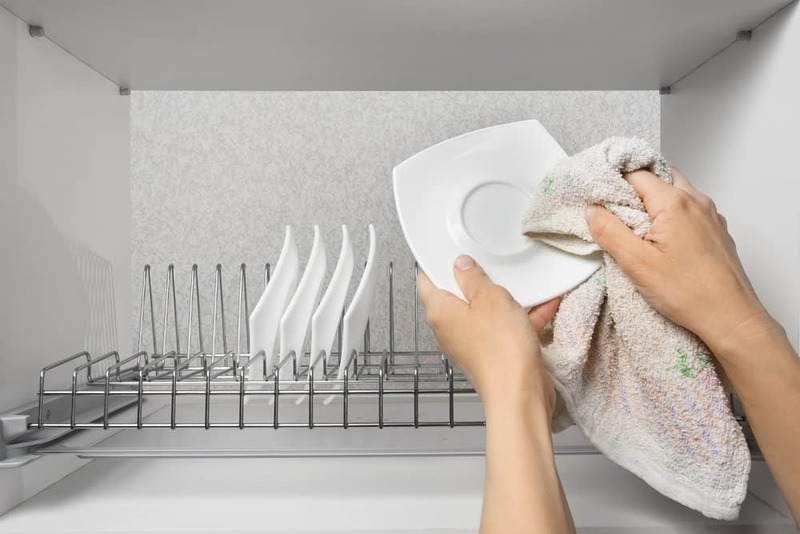 You might want to invest in a few high-quality kitchen towels for both looks and to use for delicate tasks like drying wine glasses, and then have a stash of cheaper kitchen towels for the rest of the dirty work. Whether cheap or pricey, you want a towel that can mop up liquid on work spaces and your pots and dishes. There’s nothing more annoying than trying to dry a pot only to find the towel merely pushes the water around. A note on this point: no matter what kind of towel you have, if you use fabric softener and dryer sheets, you will compromise the absorbency as these leave residue on your fabrics. Don’t use fabric softener products on your kitchen towels! 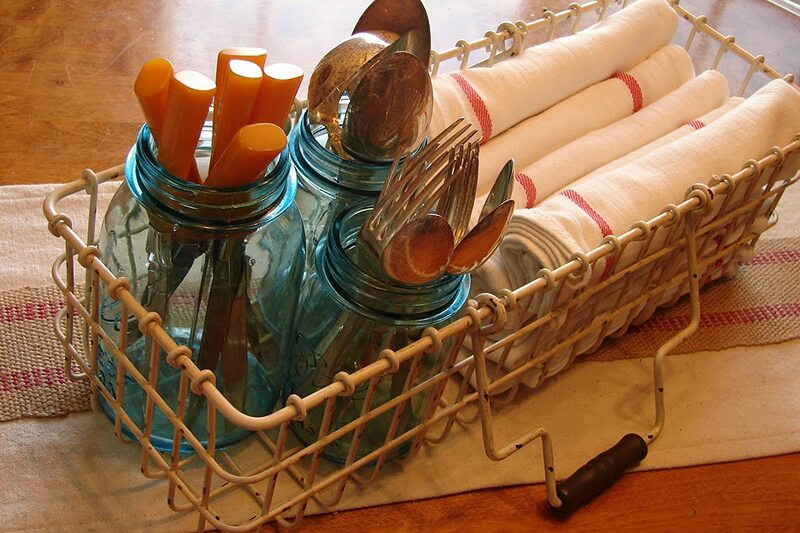 Whether you’re drying food or glassware, you don’t want little flecks of your towel left behind. With both absorbency and the lint question, the weave of the towel is a big factor. You want tightly-woven fibers so they won’t shed. Flat weaves result in a thinner kitchen towel that can double as cheese cloths and are great paper towel replacements. Thicker weaves like terry cloth or waffle weaves are also common. Again, what the towel is made of is an important factor in how it functions. Generally, 100% cotton is your best bet. It’s absorbent, resists shedding if the weave is good, and it doesn’t ignite very quickly, even without the use of chemical flame retardants (yes, this is an important factor when working near heat sources!). However, microfiber (which is usually made from a synthetic material like nylon or polyester) towels have also become popular and are very absorbent. Here are some of the options that get top marks on Amazon and are recommended on forums and in cooking magazines and websites. These simple kitchen towels have a cult following and get recommended by cooks of all levels—from average home cooks to high profile professional chefs. 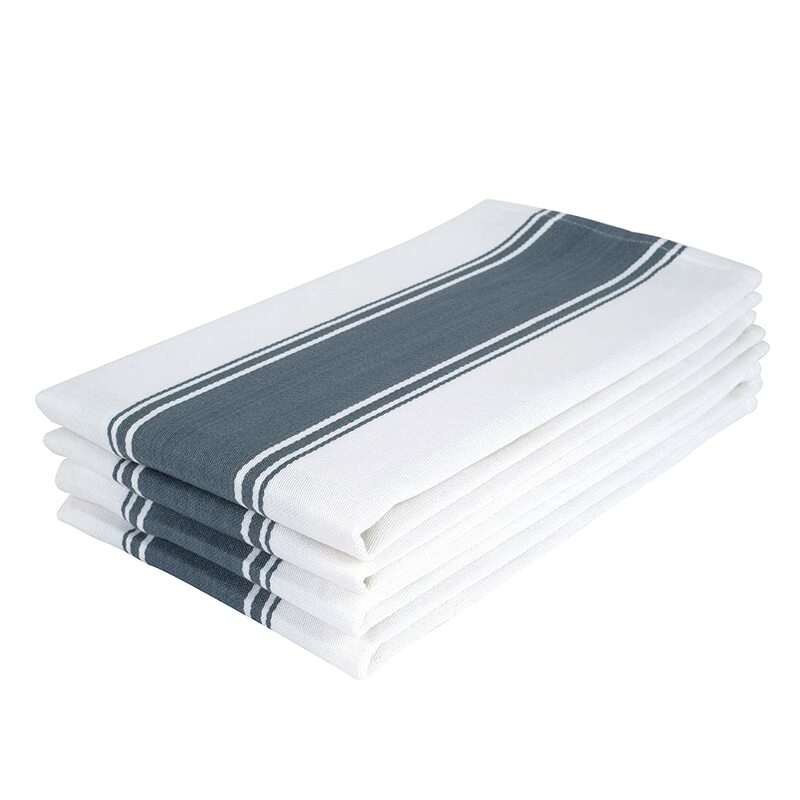 And I can personally recommend them—these make up the bulk of my own dish towel collection! 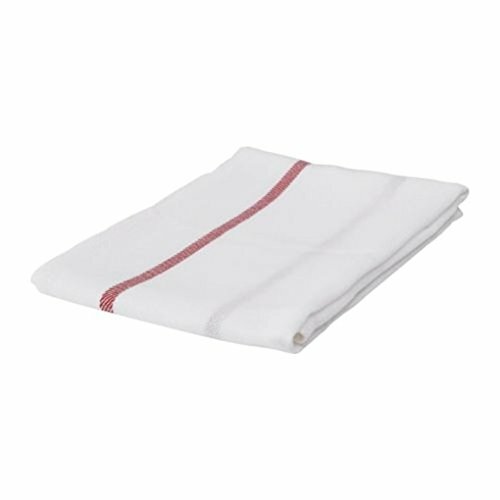 These towels are white with a subtle herringbone pattern to the flat weave and a thin red stripe down either side. I find these towels have a timeless European look to them that can still work in more modern kitchens. These towels are on the thinner side, so they dry very quickly, which I like. But despite the thinness, they absorb well and don’t leave traces of lint—these are the towels I use to dry wine glasses. The lack of lint means that these towels are excellent for food prep, too—drying produce, laying over rising dough, or wrapping up a tin of muffins. Also, they’re inexpensive, so I have no problem abusing them. The primary complaint with these is that they do stain over time. You can bleach them and it doesn’t impact the red stripe too much, but even then you may still have some issues with stains. A search across the internet for the best kitchen towels yields many recommendations for flour sack cloths. These cloths were what large flour and sugar sacks were made from many years ago. They have a very strong flat weave, so people would repurpose them as kitchen cloths because of their durability. Flour sack towels are thin but very absorbent, so like the IKEA towels, they are great for many food prep jobs as well as wiping up. Many reviewers use these towels for cheese and yogurt making. They make a good paper towel replacement. These particular flour sack towels have a huge number of reviews on Amazon, the vast majority of them positive. However, some people find these towels too thin—almost gauze-like—with a very loose weave. Some also find that these towels are poorly hemmed. This may be due to manufacturing inconsistencies. 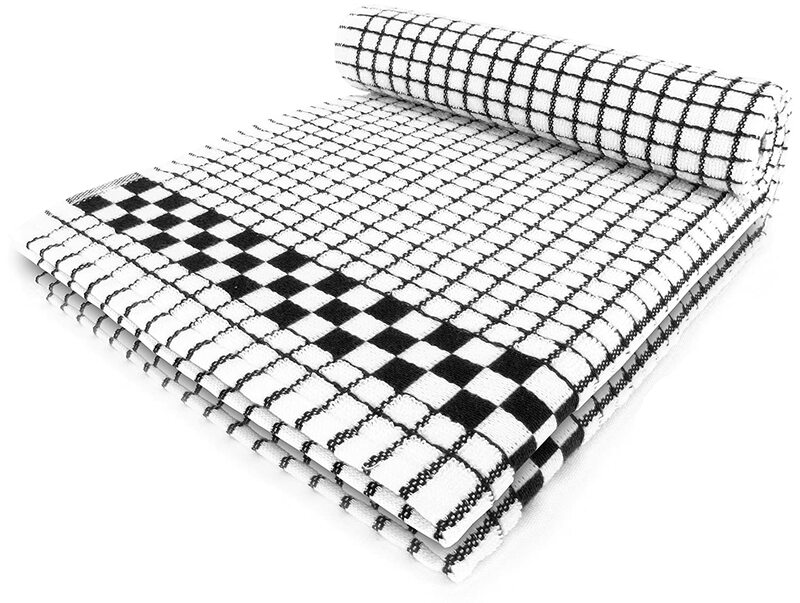 These kitchen towels come highly recommended on Amazon and are available in a number of checkered pattern colors. They are 100% cotton and made in Portugal. These towels are lint-free. They are terry cloth—meaning there are loops of thread to create texture and contribute to the absorbency. There are so many rave reviews for these towels—people really love them and say they are the best they’ve ever used. Owners find them to be very absorbent, nice and thick, and a good size. Few people have anything negative to say about these towels. In my mind, the biggest drawback is probably the price, which may preclude you from using these towels as a replacement for paper towels. But these would make great display towels for all manner of drying and clean mopping up tasks if you want a varied approach to your kitchen towel stash. This is another nice option for kitchen towels you may want to show off. They are made in India of 100% cotton. They come in a variety of different colors with a thick stripe pattern on white. It’s a simple, classic but modern design. 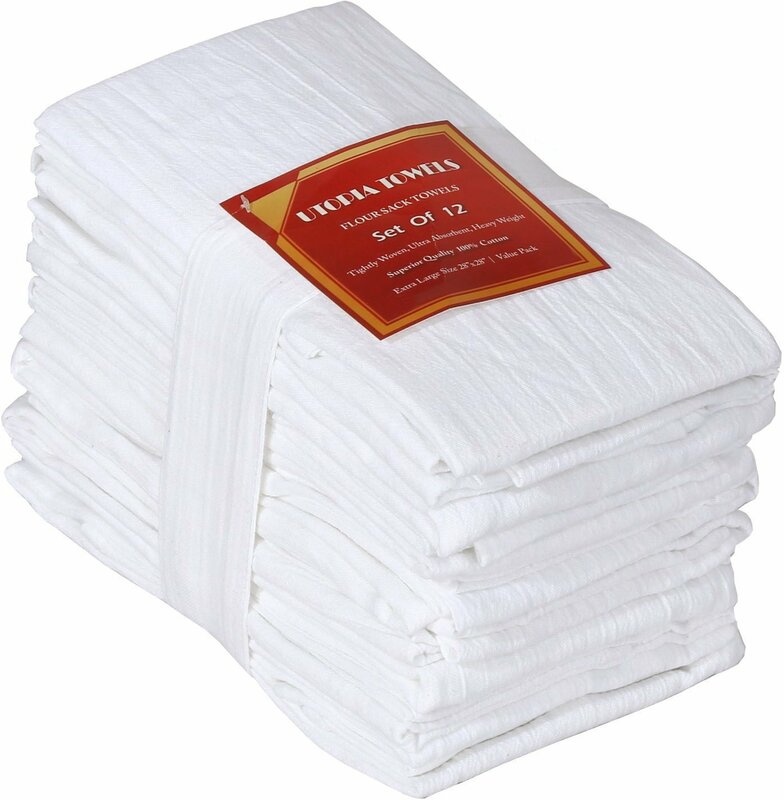 These towels are lint-free, wrinkle-resistant, and thicker than something like a flour sack cloth, although they too have a flat weave. They have a loop on one corner for hanging. Owners of these towels say the craftsmanship is apparent with these. They are thick and soft to the touch, and live up to their claims. Many people ordered some and quickly ordered more, and plan to buy these as gifts. These should not be bleached, but generally wash well according to owners. Although they resist wrinkles, some people find that the seams do curl over and would need to be ironed to be completely flat. Otherwise, like the Fecido towels, people have few bad things to say about these ones, so again I’ll point out the higher price. Now that we’ve discussed the details of kitchen towels, perhaps you’ll give more thought to this seemingly insignificant purchase in the future! There are great options for these kitchen workhorses at all prices—no need to buy inferior kitchen towels. My dream kitchen would have a combination of the IKEA Tekla towels to act as my paper towel alternative, and a set of The Homemakers Dish Kitchen Towels to be the higher end but still functional display towels. I personally like a flatter weave in a towel and I love the modern stripe on these ones. If you like thicker terry cloth, though, the Fecido Classic Kitchen Towels seem to be a solid choice! Have you given much thought to your kitchen towels? Which are your favorite?